The opinions expressed are those of Bruce Anderson. This site is updated periodically, so please check often. 1977 Cell 1 of the new lined landfill was opened. The landfill was permitted by the Department of Environmental Protection to accept only dry non-hazardous chemical waste. 1979 January, the Department of Environmental Protection granted a ten year permit to operate the landfill. 1979 "The Department of Environmental Protection discovered that Cell 1 of the lined landfill was leaking to a significant degree between the double liners." 1980 "The Solid Waste Administration has reviewed the data on the analysis in volumes of liquids pumped from the primary leachate sumps and the leak detection sumps of both Cells 1 & 2 of the subject facility, and has concluded that the data indicates leakage of liquid through the primary liners of the two cells. The Solid Waste Administration also maintains that the intention of the approved engineering design was to prevent , not minimize, any such leakages, and therefore, the Solid Waste Administration has concluded that the two landfill cells construction at the subject facility are not performing in accordance with the intention of the approved engineering design." 1981 A memorandum in reference to experiments on actual liner material states, "Enclosed are three strips of liner material. The discolored sample is a section of staff-oil resistant PVC, which has been immersed in leachate from our landfill, for 593 days. This is "field joint' material, and the joint failed after 65 days in the leachate." Toluene affects all liner material, with a "review of the Cell 1 sump data also indicates that toluene is a major component of the leachate." 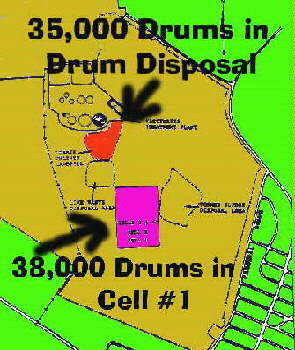 "Also, over time, drums of waste disposed in Cell 1 have been rusting and corroding. As a result, an increasing number of drums are likely deteriorating and contributing their contents to the leachate." "Thus, both regulatory agencies and the scientific community recognize that synthetic liners of all landfills will eventually degrade and cease to provide an adequate barrier to migration of leachate out of the bottom of the landfill." August 2000: Government Agencies should work together to remove all the drums from the Ciba Geigy Superfund site in Toms River, NJ. October 2000: What government agencies have not mentioned! April 2001: Government Agencies have failed to protect the citizens of Toms River, New Jersey in the past and the question remains are we being protected today? At the last Citizens Action Committee on Childhood Cancer Cluster meeting the EPA reported there is significant levels of trimer in the soils at Reich Farm. One has to remember in 1995 an incinerator was used on the soils of Reich Farm to remediate this superfund site. Although it was initially reported that the incineration resolved the soil contamination problem, EPA recently realized that the testing done back in 1995 would not have detected the SAN trimer. We credit EPA for going back and testing the soil for trimer. This sampling revealed average levels of 660 ppb, high of 3.4 ppm. These are below the clean up standard of 10 ppm for semi-volatiles, but still a concern and more extensive sampling should be undertaken. This raises the question of whether the trimer could still be entering the groundwater from the residual contamination in the soil. It is important that EPA follow up with more detailed studies so we can get a full view of the problem. Members of T.E.A.C.H. believe in supporting our community. Over the years, we have awarded over $50,000 in total scholarships to Toms River, New Jersey, 12th grade high school students. We will honor the remaining scholarships that have been previously awarded. Approximately 38,000 drums of toxic waste will be left on the Ciba-Geigy Superfund Site in one landfill, while 35,000 drums of toxic waste will be removed from another. EPA officials have expressed no interest in these additional drums and are not interested in the public concern. Why aren't our government agencies working with and protecting the citizens, instead of having close ties to the corporate giants. It is only common sense to remove all drums of toxic waste now, not when the drums leak and pollute our aquifer, which will occur over time. Toms River has enough contamination plumes to deal with, why clean up one and leave a potential one for our children? The access road to remove these drums is here today and removal can be completed if only the company and our officials would listen to our concerns. We encourage the public to help us by writing letters to the Governor of New Jersey, Senators and Representatives on all levels requesting that action be taken to remove all toxic drums of waste buried on the Ciba Geigy superfund site. Please help support our efforts, for now is the time to take action to remove these additional 38,000 drums. This link is to the News Article on the EPA Meeting of May 29,2002. Several important meetings are scheduled, for further details look under "Local Events" on the sidebar or click on this link. The previous cover page can be found under "RESOURCES", Previous Month's Cover Pages.